So you want to apply some formatting to your fics! You probably already know how to use some basic HTML tags to make stuff <strong>bold</strong> or <em>italic</em>. But perhaps you want something a bit more complex - a different font, or maybe a different color. You can do this by creating some custom CSS for your works! Cascading Style Sheets are a way to style elements of your story (or any webpage) without having to mess with the HTML markup itself. Where you used to scatter <font> tags all over your code to make some text look like this and some like that, you would now simply assign names (classes or IDs) to parts of your webpage and do all the styling in a separate document (the stylesheet). The upside of this is that if you decide to change the look of your page, you don't have to comb through the HTML code and change all the tags, you can just play around with the CSS rules until you find a style you like. As is so often the case, things are a lot more complicated once you really dive in, especially if you use CSS to position elements on a page, but this shall not concern us here. 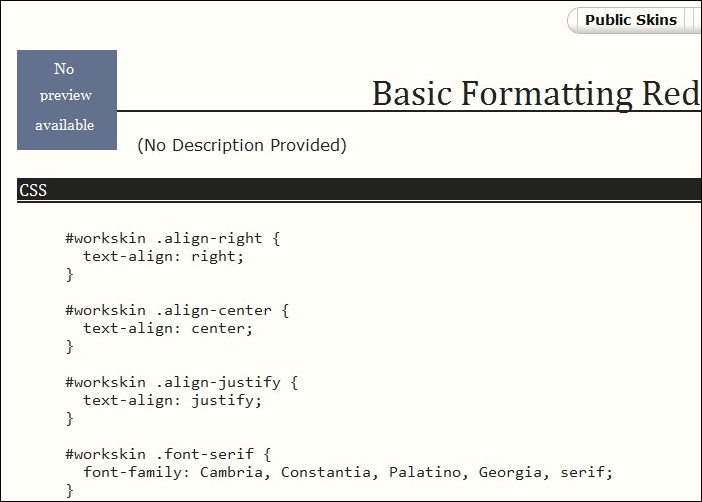 You will most likely use CSS to apply a little formatting to your fic that goes beyond the allowed HTML tags, which is what this tutorial will be about. You may have already used Archive skins to change the way the Archive as a whole looks to you when you are logged in. Formatting a work uses the same basic principles: to apply styles to your fics, you create a "work skin" and define what classes you want to use in your stories and what they should look like. And while the general archive skins only affect the user that created them, the styling that you define for your fics will be visible to all readers (unless they disable custom styles; more on that later). Under Dashboard > My Skins > See Work Skins Instead you'll see a work skin like this, with CSS rules defined. The #workskin at the beginning of each line is an id, and is added automatically. It makes sure that the CSS can be applied to your whole work, and isn't applied to the rest of the page. The words which begin with a period, like .align-justify are classes. These allow you to create a specific rule and apply it to a specific bit of your work. When you define these in your work skin they must have the period at the beginning. When you edit a work, you'll use markup like this to apply the CSS rules in your work skin. If you style a story so heavily that it becomes unreadable or if the reader simply doesn't agree with your font choice, there's a "Hide Creator's Style" button on top of each work that will strip out all bells and whistles except for the basic HTML formatting. CSS formatting will not appear in downloads (.pdf, .epub or .mobi files) either. Keep this in mind when you apply CSS to structure your story and make sure it doesn't fall apart when all CSS is stripped out. CSS formatting is a great way to enhance certain elements of a story, such as letters in an epistolary fic or character voices in a story that's told from two points of view, but it shouldn't overshadow the actual contents of the fic. Sometimes you really just want a <strong> tag. Conversely, while there is an option to "Hide custom styles on works" under Preferences, which will hide all CSS by default, you might lose out on some really neat stuff if you never see it in action. You can find an example stylesheet under Public Work Skins that comes with the most common formatting options already in place. Chances are, if you just want to change some text alignment or font colors, you won't even need to build your own stylesheet. Of course, you can also add more classes or create separate skins as you go. The world is your oyster! Just don't forget to pick the skin from the "Custom Stylesheet?" dropdown when you post. Let's have a look at some CSS classes. This is an <span class="font-orange">example</span> sentence. Achtung! Keep in mind that the parser will interpret all carriage returns as linebreaks, so don't use new lines to make the code easier to read for you. They will get turned into <br /> tags. You can use CSS to style the main body of your work, and in notes fields. You can't use it in summaries, because these show up in indexes, where user-input CSS is not supported. So, if you want to use styled text to include warnings or spoilers, you'll need to put these in the notes field. To see how this all works in practice, check out our example story Sliding Doors. Can I use inline CSS? No, sorry. We've chosen to limit CSS to work skins in order to preserve the separation of style and content. 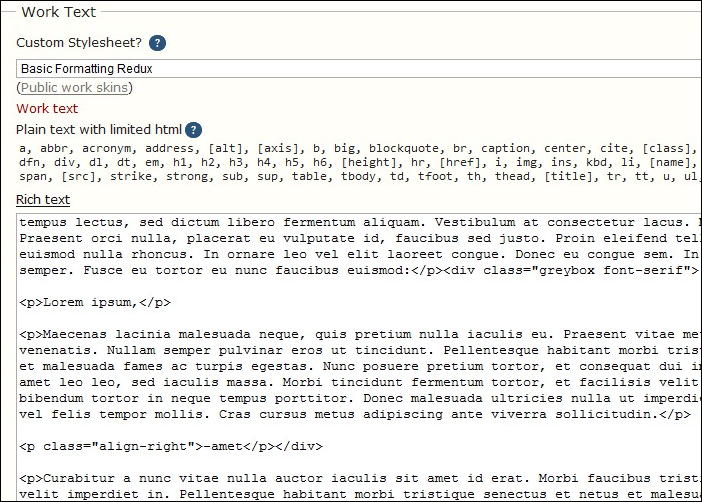 By creating reusable classes for your fics you can control all your formatting in one stylesheet, and we can easily strip your CSS from a story (important for accessibility reasons) without interfering with the site caching (important for performance reasons). Everybody wins! Do I need a separate skin for every work I post? No. The formatting rules you define in one stylesheet can be used and re-used in any of your fics. However, if you have a series of stories that rely heavily on CSS for consistent formatting, it might make sense to create a separate skin just for that set of stories. What if I never want to see styling on other users' works? Check the "Hide custom styles on works" box in your Preferences. Alternatively, you can disable styles on a case by case basis by clicking the "Hide Creator's Style" button above the story header. Will the custom CSS also be applied to file downloads? No. The files you download (pdf/html/epub/mobi) will have no CSS formatting. For more help on using CSS for styling, you may find the below sites useful. CSS is used to style all modern websites, so there are lots of resources out there (and it's well worth learning a bit about it).